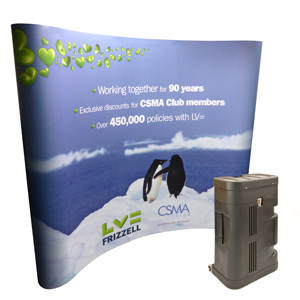 Designed to be highly portable, our exhibition banners, stands and displays are easily built with little to no experience. If you are looking to order exhibition banners for an event that you are exhibiting at we will be happy to help and advise you on your options available. Please send us your enquiry by email or call us and we will be happy to help. For low cost exhibition banners look no further. 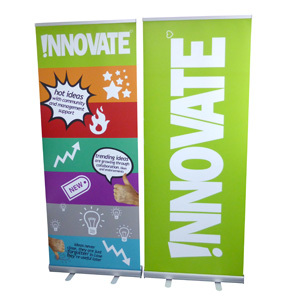 We have over 50 different types and sizes of roller banners to choose from with prices starting at just £45+vat. For large orders please email us your requirements for bulk order discounts. As with anything, a slightly bigger budget could buy you something that bit nicer and indeed will last longer. For better quality hardware with exceptional printed graphics we would recommend our Barracuda roller banners at just £129+vat. Barracuda banners are easy to use, look great and have exceptional build quality. 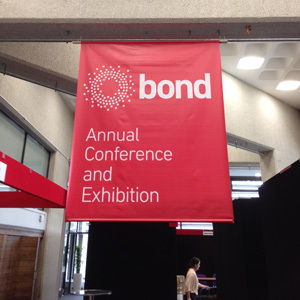 Exhibition banners, branding and signs printed onto banner PVC or fabric for use at exhibition halls, conferences and events. Single or double sided options available, printed to almost any size. We can also supply fixings for hanging or installation services if required. 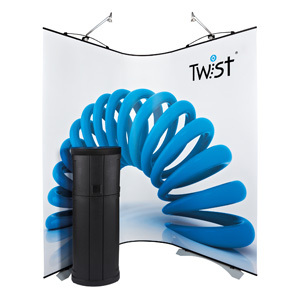 The Twist banner can be used as a single banner stand or joined together to form much larger exhibition displays. It also has the option of having flexible graphics built into the design to add shapes to your exhibition stand. 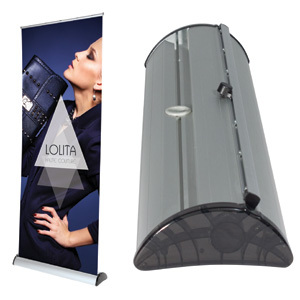 This modular display system is one of the UK’s most popular linking banner stands. It is available in multiple height and width options enabling it to fit to any stand space. Selling both complete systems as well as replacement graphics panels we have a vast range of exhibition pop up stands. To complement your exhibition stand we also sell exhibition counters, literature stands and iPod holders. “We had used RGL Displays before and returned to them because we were pleased with the product the first time around. We’re happy to say that they didn’t disappoint on this second occasion and our banners have turned out brilliantly. RGL Displays understands that budgets vary. Because of this we sell many different types of exhibition stands, trade show banners and graphics to meet these demands. From low cost roller banners to impressive self built modular display stands we have the perfect solution for your event. With an increasing amount of outdoor exhibitions and events being held each year we also offer outdoor printing. Some of the items that we supply include outdoor PVC banners, exterior vinyl’s, roadside banners and signs. Printing both indoor and outdoor graphics means we can alleviate some of the pressure on our clients. This one shop printing service saves our clients valuable time which can be spent in other areas. Most of our exhibition banners are small enough to be carried by hand and are designed to fit within a car or van. This saves further costs on transportation to and from your event in most situations. Over 27 years experience in high end print and graphics. Therefore RGL Displays have the knowledge and expertise to help your company with their exhibiting stands and graphic requirements. We also realise the importance of good customer service, quality of product and reliability. I only have a small budget, can you help ? How quickly can you produce my banners ? Do you print banners for outdoor events ? Yes, although RGL Displays only sells quality exhibition banners a single banner costs as little as £45+vat. Furthermore we also occasionally sell discontinued exhibition stands at knock down prices saving you big money ! If you have a tiny budget for your banners please let us know and we’ll do our best to help you. Given that we have four high quality printers in-house we can produce your exhibition banners quickly. So much so that we pride ourselves on never missing a delivery date. Therefore roller banners can normally be produced within 1 to 3 working days with average lead times of 3 to 5 working days on most other products. If you are ordering fabric banners please contact us for a more accurate lead time as these can take slightly longer during busy periods. Yes, at RGL we print event banners for outdoor use which are fully weatherproof and UV stable so that they will not fade in direct sunlight.